One of the best parts about working at a bead store is meeting local beaders, every day introducing us to new artists and projects. One stand-out beader who caught our eye was Sarah W. of Snowy Owl Jewelry. With such bold designs and a striking aesthetic, we had to feature her! You can view more of Sarah’s work for sale on her Etsy Page or at Evolve Salon on State Street. Her portfolio is also viewable on the Snowy Owl Jewelry Facebook Page. A: I’ve been making jewelry since I was a kid, but I started doing it a lot more in 2006. I got my business license in 2008. Q: How did Snowy Jewelry get started? A: When I moved to Bellingham I liked doing all different types of art. At first I made jewelry as gifts, and I was encouraged to sell it. I love the strong focus in Bellingham of supporting and buying local artists, thrifting, and re-using. There’s such a large local market, which is great! Q: How did you come up with the name “Snowy Owl Jewelry”? A: Don’t remember exactly where the name comes from. I love owls and make a lot of pieces with owls in them. The snowy owl is beautiful and majestic with the strong contrast between black and white; it’s nature’s art. A: Always growing and changing. I really enjoy stones, metal, and pearls. It took me a while to start designing pieces in colors I wouldn’t necessarily wear, and I now love them and use them all the time. A: In life or in my jewelry? I have very vivid dreams and will dream about the details of a new piece of jewelry and make it. I also love seeing what other people are doing on Etsy and Pinterest. A: Indirectly. My father used to make jewelry when I was a child. I remember being a kid and he always had a rock polisher sitting in the corner, tumbling stones. He had a tall set of tool drawers filled with stones organized by color. I always wanted to look at it and play with it! A: I did acting when I was younger and am just now trying to get back into it. I’m going to be acting in and designing some jewelry for a local film next month called “The End Date”. It’s an independent short film. I do acting and modeling whenever I can. It’s been fun working on projects like that. I love film, creative, artistic, independent film. I love to read, write, and draw. Pisces are supposed to be artistic. I think it’s true! Q: Do you have any hopes or ambitions for Snowy Owl Jewelry in the future? A: Eventually I’d like to get enough exposure and experience that the business will thrive online. I think every artist would like to be self-employed, self-sustaining. The more you can do for yourself, the better. Thank you, Sarah, for allowing us to interview you! Feeling inspired? Sarah’s work will be displayed and sold at the Bead Bazaar, starting July 8th! Make sure to stop by and show this local artist some love. One of the best parts about working at a bead store is meeting local beaders, every day introducing us to new artists and projects. Bead Bazaar is participating in Fairhaven’s Summer Solstice Walk About, and we’ve decided to feature Bellingham artist Alice Racer for the event. While we knew that Alice was accomplished at intricately woven seedbead pieces, we were pleased to discover that her artistic side was incredibly dynamic. Alice’s beaded baskets are darling, and her jewelry falls perfectly into place with Fairhaven’s old-time roots. Read on for more information and inspiration from one of Bellingham’s artists. Alice Racer’s artistic interests are multifaceted. A fancier of the Japanese style of poetry Haiku, she illustrates both verses she admires from others as well as those she has penned herself. She is a photographer with her work appearing in several different publications, all with a botanical theme. It is within the last 10 years that she has taken up beading. Inspired by Native American bead work from the time she was six years old, Alice remembers her family visiting a predominately Cherokee town in Virginia at the time. While there, they bought her a locally made woven seebead necklace. 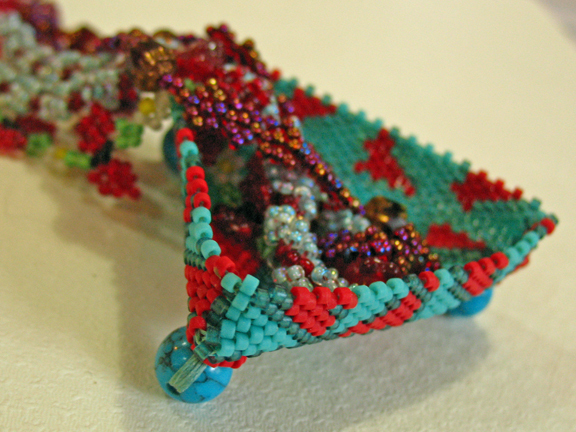 Although she didn’t actually take up bead work until many years later, she was intrigued by its intricacy. Still owning that original necklace, she has appreciated the earthy colors and patterns of traditional bead work ever since. 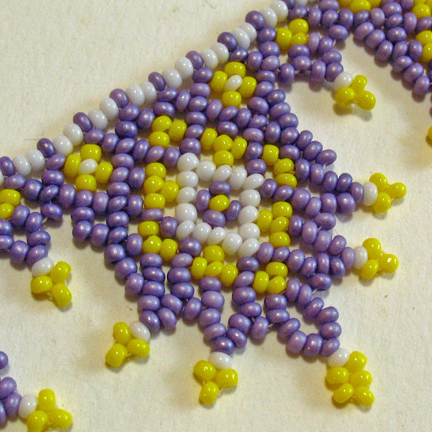 Alice’s own bead work consists of patterns using peyote, square, and rosette stitches. 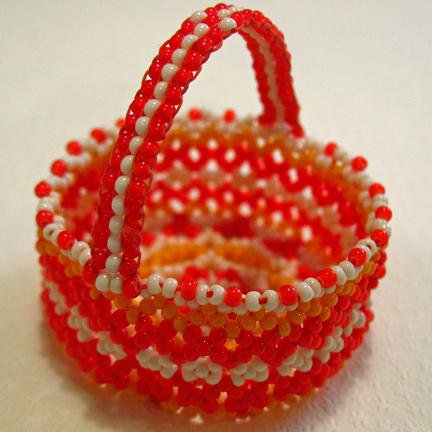 With Czech and Japanese seedbeads, she creates delicate miniature baskets as well as intricately worked floral necklaces and bracelets. Her work will be featured in the store during Fairhaven’s Summer Solstice Walk About, Friday, June 22nd, 5:00pm-8:00pm. Her baskets are for display only while her necklaces and bracelets are available for purchase.